You’re done shopping for your Thanksgiving meal, right? That’s a huge bonus as now you will have time to perfect the art of setting your Thanksgiving table. 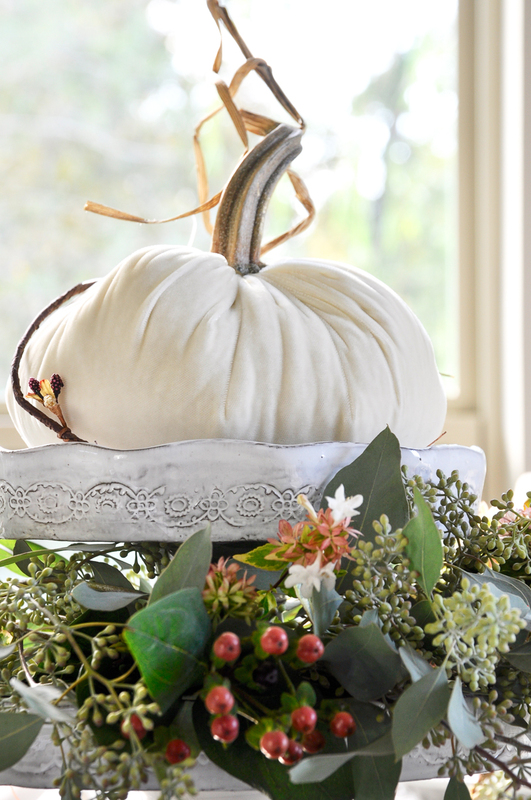 Sure, your guests are focused on turkey, stuffing and more pies than you can count. Who isn’t? But, you focus on the table and they will be amazed when it all comes together. Preparing the perfect Thanksgiving table may seem like an extra piece to the holiday puzzle. However, with a little planning, it is quite simple to pull off. See other thanksgiving tables here and here. I was going for a simple look that could easily be done last minute. 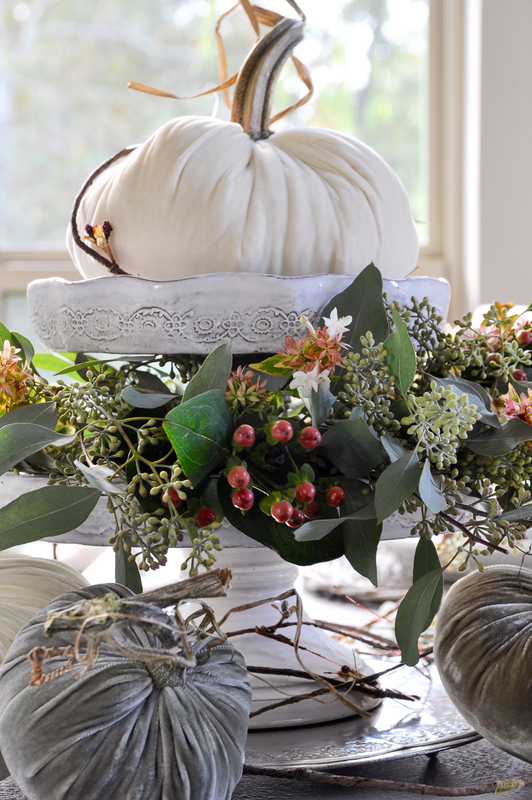 For added height, I chose to stack two cake stands and placed them on a platter for a strikingly different centerpiece. 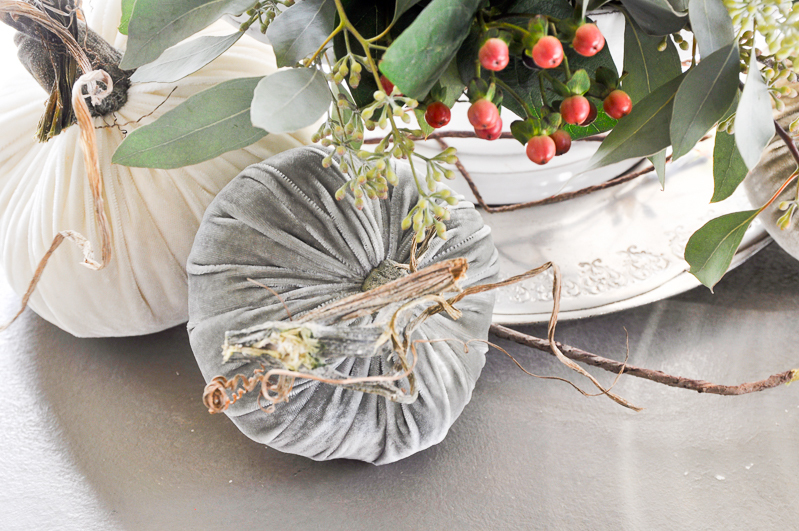 I started with an ivory pumpkin which allows me to consider various color palates. 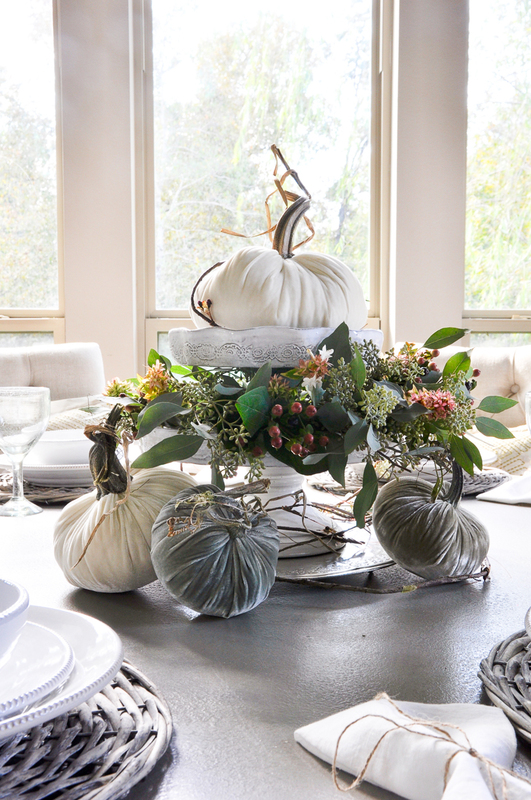 I then added greenery and berries to the cake stand and additional velvet pumpkins to the table. 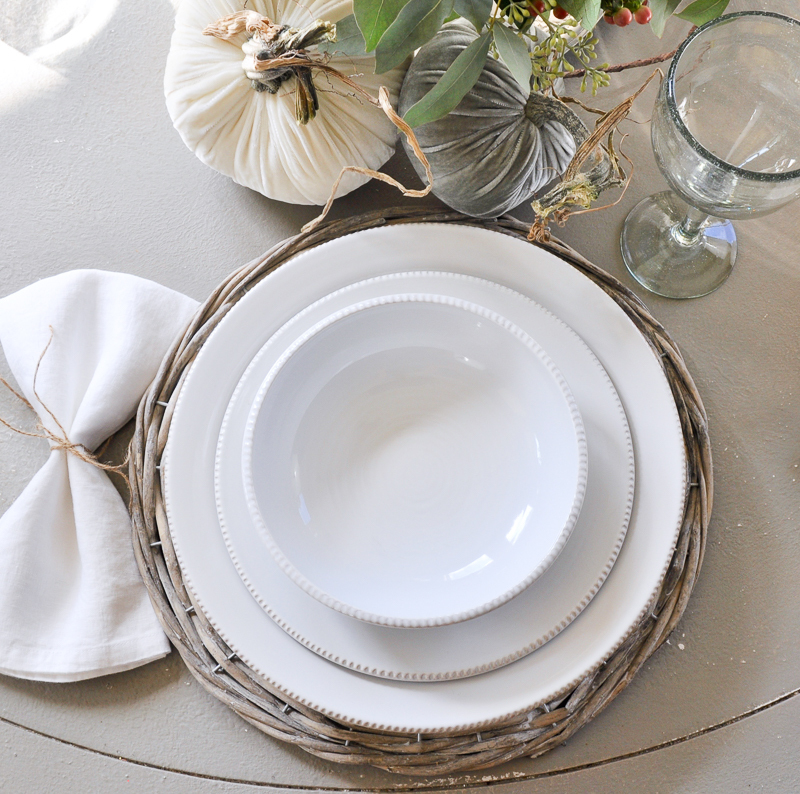 I love these wicker chargers for a less formal look. 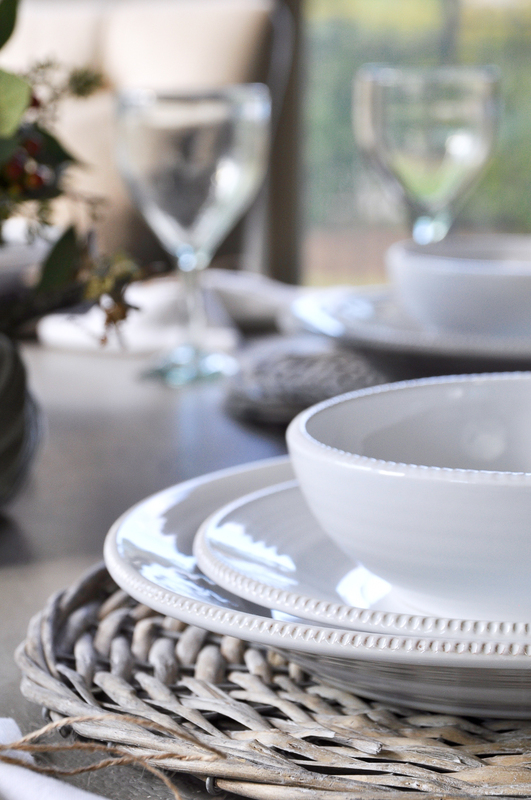 White dinnerware is a classic choice which works well in this more casual setting. The entire look is bright, fresh and sophisticated without being too stuffy. You might have seen these before here. I adore these beautiful velvet pumpkins by Hotskwash. 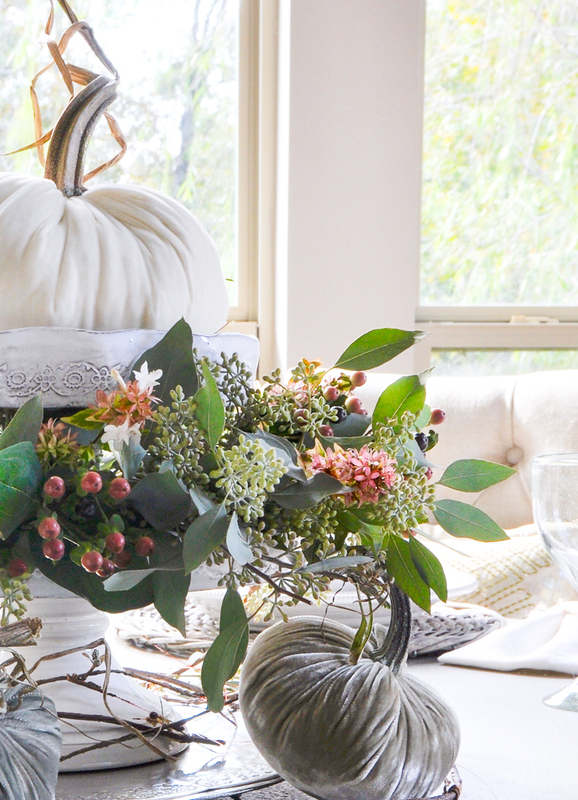 (Shop velvet pumpkins below). 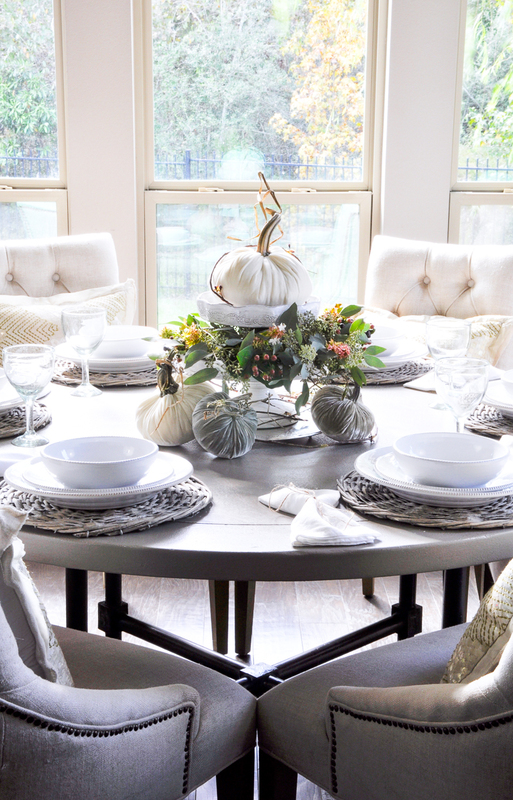 Not only planning your Thanksgiving meal, but also planning for your table is something that will make your family and friends feel a bit more special during the holiday season. You can mix and match items from your garden along with classic dinnerware and beyond. The possibilities are truly endless. Your approach does not have to be overly complicated. A little foresight and planning will allow you to pull this off without a hitch. You can find additional breakfast nook sources here. So beautiful…… I’m so happy I’ve connected with you and your community of bloggers. Your homes are truly inspiring. Simply beautiful Jen! Happy Thanksgiving friend.